No matter the size of your business, excellent customer service needs be at the heart of your business model if you wish to be successful. It is important to provide good customer service to all types of customers, including potential, new and existing customers. Did you know that according to American Express, 55% of consumers have intended to make a purchase, but backed out because of poor customer service? Businesses all across the world tend to lose billions of dollars every year due to poor customer service. The thought of improving their customer service can be a headache for SMBs. Many small businesses know that they should enhance their customer support efforts, but they don’t know where to start. They’re either aware of too many options (information overload) or not enough. Luckily, customer service is easier to improve than you think. Similar to new theories about how being more productive often means taking less time to do more focused activities, customer service can be improved through focused strategies and a shared goal of customer happiness. Adding live chat software to your website is just the beginning. At ClickDesk, we love helping smaller businesses offer world-class customer service. 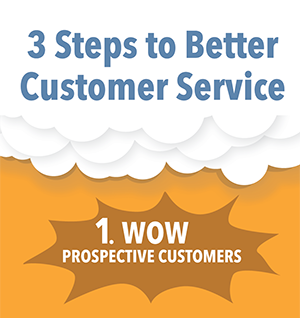 We’ve put together a new infographic highlighting 3 steps to better customer service. The first step is to wow prospective customers, but we don’t stop there. We explain how to make unhappy customers happy–and happy customers happier–throughout the customer lifecycle. The following infographic suggests 3 ways to deliver better customer service and consequently, customer retention and repeat business. Have a look and feel free to share.